A study by researchers at the Center for Retirement Research at Boston College identified four structural changes that are pulling the birth rate down. First, the growing ranks of women with a college education are changing the calculation about children: they are having fewer of them. Second, college-educated women have better job options, and their rising earnings, relative to men, during the period analyzed have increased the financial cost of being a mother, reducing fertility to a lesser extent. Another change is that women who do not belong to a religious congregation are also having fewer children. Their birth rates are lower than they are for women who do belong to a congregation, according to data for 2013 through 2015 – for example, the non-members have one less child than fundamentalists, who have the highest fertility. Finally, the researchers looked at changes in the Hispanic population, which historically has had higher fertility than the nation’s blacks and whites. Since 2007, however, Hispanics’ fertility rate has been dropping, coinciding with the fall in immigration after the Great Recession. Part of the reason for this decline is that U.S.-born Hispanics have lower fertility than immigrants from Latin America, so the Hispanic population overall is having fewer children. The black population has closely tracked white fertility for years and both continued downward during the recovery too. 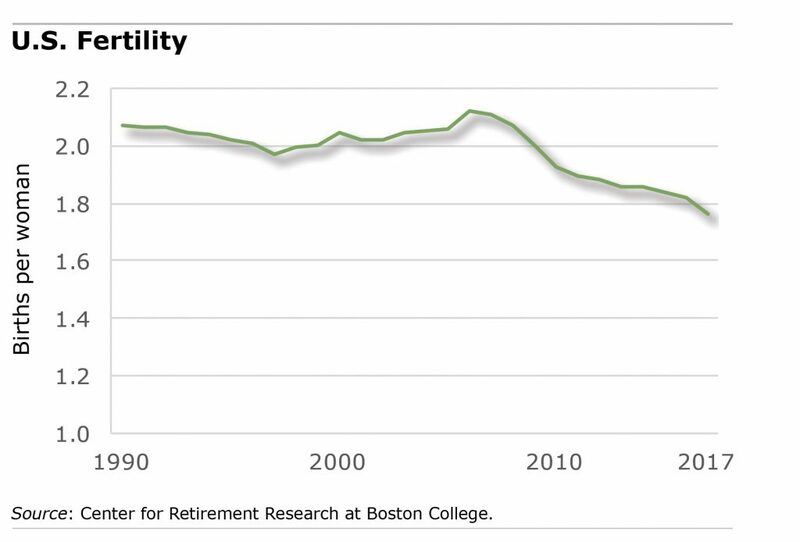 The researchers conclude that the decline in U.S. fertility may no longer simply be economic fallout. Sweeping changes in the U.S. population are having a larger effect. Have you correlated the decline in birth rates with the lack of increase in median wages for the 18 to 35 year old age group? No Larry but that’s an interesting idea! I will pass this on to our researchers. I recall this article from a couple of years ago, indicating that not only does the fertility rate go down as incomes go up, but – at the individual level – rich families tend to have fewer children than poor families. That might be contrary to the stagnant median wage theory. Just to point out that the relationship shown is across countries, not across households within countries. The missing middle class (lack of wage increases and wage declines) is also the first thing I thought of when I read this.